Where does music come from? 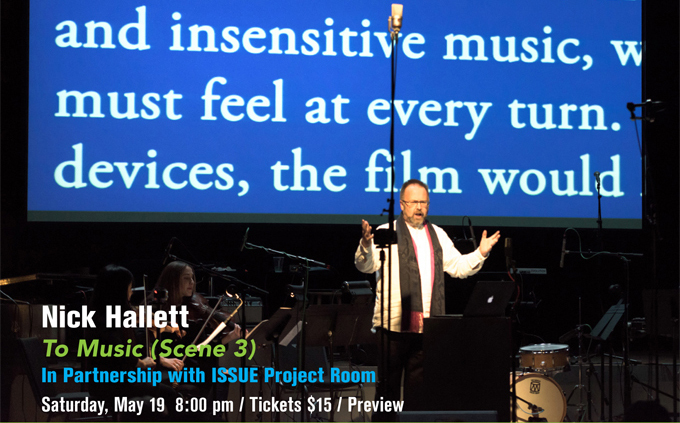 This darkly comic opera, a collaboration between composer Nick Hallett and filmmaker Josh Thorson, looks at the nature of inspiration, originality, and illusion to attempt an answer to this question. Through the cautionary tale of a fictional composer’s social media behavior, To Music investigates the creative process and its distractions—a portrait of the artist on Facebook. Sonic worlds collide as pure vocalise, glossolalia, poetry, and profanity weave through German lieder, mobile phone ringtones, Modernist dissonance, and Top 40 radio. Featuring vocalists Mellissa Hughes, Peter Alex Stewart, and Amelia Watkins and instrumentalists Jeanann Dara, Melinda Faylor, and Sarah Bernstein. Nick Hallett is a Brooklyn-based composer, vocalist, and cultural producer working between the worlds of sound, art, and performance. He recently completed a trilogy of scores for the Bill T. Jones/Arnie Zane Company, and received a 2017 Bessie Award. A workshop of To Music was co-produced by Experiments in Opera and Gut City.